Physical Description Piraash is of middling height and build. She wears her hair long and often hooked behind her ears. 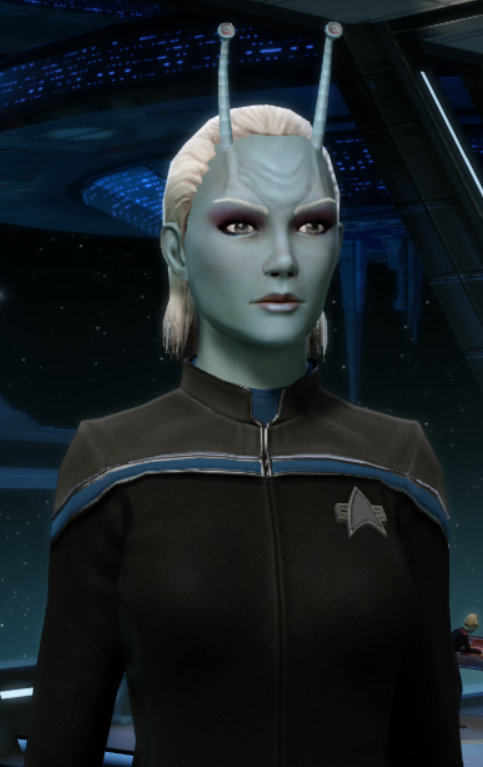 She has a very angular face and like all Andorians she has two antennae sprouting from her head. Personal History Piraash was born on Andoria in 2360. She grew up in a small subterranean settlement near the planet's southern pole. She had many friends, and wouldn't hesitate to meet new people and include them in her ever expanding social circle. Despite this, Piraash was a very big trouble maker. In 2378 she joined starfleet academy and there she met Oshesaon. They quickly became good friends, and had many classes together. When they graduated in 2382 Piraash and Oshesaon were assigned to different vessels, but promised each other that they would keep in touch. Piraash was assigned to the USS Echo, and spent her first three years on a deep space exploration mission. As such her contacts with her friend Oshesaon became increasingly sporadic. When the Echo returned to federation space in 2385 Piraash was transferred to the USS Amazon. Upon reporting in aboard the USS Amazon Piraash was delighted to see Osheason again as neither of them had know that other was coming aboard. Their friendship quickly found its old fire and soon became romantic. They spent a couple of years living on the Amazon before they decided to take a break from Starfleet and go to Andoria to finish their Bondgroup. They met Ishresse and Kysoahl, and the four quickly decided that they would do well together and spent time getting to know each other on Andoria. They returned to Starfleet in 2388 and all four were assigned to the USS Tangaroa. In 2390 the USS Tangaroa was involved in conflict with some pirates. They were boarded and during this incident Piraash and three other officers were taken as a hostages when the pirates took control of several science labs, including the one they had been working in. Using her natural friendly nature Piraash was able to distract the pirates for long enough that a security team was able to break in and rescue them. For her actions on that day she was promoted to the rank of Lieutenant JG. In 2395 her Bondgroup was transferred to Langley Station.